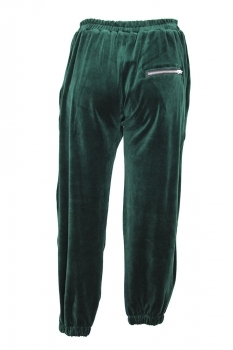 Barbara Bologna stretch fabric, dark green, velvet jogging trousers. Gathered, elasticated waist, with embroidered 'Barbara Bologna decal in black and silver. 2 side pockets with zips. Elasticated and gathered hems. Single rear pocket with zip. These trousers match the jacket in the same colour.